Happy New Year from all of us at Our Neck of the Woods. We hope 2014 is your best year yet. Thank you so much for your continued support and friendship. We really appreciate it! Happy New Year to you too! We are so happy to have known you and look forward to reading and seeing more of your neck of the woods. Great photo! Happy New Year to you too! Matching eyes...lovely. All the Best in the New Year Tammy and David and the furries & feathered ones, too. Happy New Year Tammy & crew! Sending you peace and comfort today. Such a cute picture! Happy New Year Tammy! Happy new year! Cute picture. Hope you have a great 2014 as well. 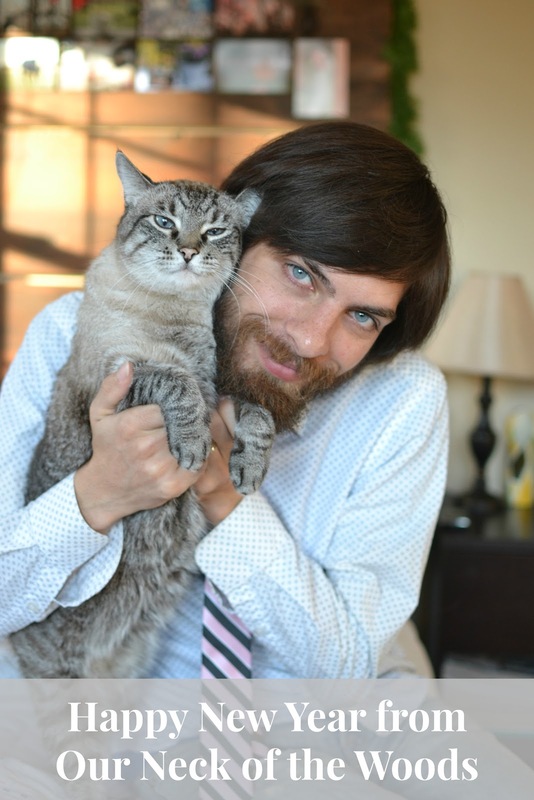 Nice photo of your hubby and kitty. Happy 2014! Aww! Happy new year to you! Wishing you and yours the very best in the New Year Tammy. So cute that they both have those lovely blue eyes !! Happy New Year. I am looking forward to hearing about your adventures in 2014! Awww.. What a great photo.. Happy 2014! Happy new year! All the very best for 2014! Happy New Year to you and your family Tammy. Wishing you hope, love and peace in the new year. may you and yours enjoy peace, health and happiness in the coming year! Happy New Year to you Tammy and your Hubby and ALL your Creatures - Great and Small! Happy New Year to you and your charming family! I wish you a great year also and good health!